Looking for a versatile training room? Special discounts for members and during school holidays. 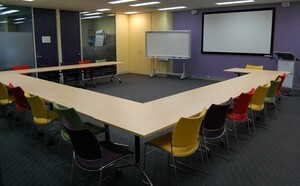 - Seats 25 horse-shoe or cabaret style and up to 45 theatre-style - Includes electronic whiteboard, flipchart, data projector and large screen - Includes small break-out room Rates for a full day are $400 for member organisations and $500 for non-member organisations. Catering can be arranged from $20 per head, including morning and afternoon tea, and lunch at a local café.